If you are buying or selling at Kensington Auctions, this guide aims to help you from both a buyer and seller's perspective. From a buyer's perspective, Kensington Auctions is one of the most exciting ways to buy fine art, fine jewelry, fine gems, luxury cars, and antiques to name a few. You will find many types of collectibles and you may even discover a unique bargain, which adds to the fun. Follow our guide to getting the most out of an auction. When buying at auction, make sure you allow yourself enough time to thoroughly examine the lot, and for those that are new to the process, it helps to go to auctions regularly, even as an visitor. This activity really helps you to find out what you are interested in before beginning your quest. Be certain to obtain a catalog, read the description and askquestions. The catalog helps you to acquaint yourself with the goods and their prices. It also lists all the objects, or groups of objects, in the order in which they will be sold. In the auction world, these are known as 'lot' numbers. It is very important to pay attention to the exact wording of each entry. Read the explanations at the beginning of the catalog. The explanations tell you the significance of words such as 'attributed to', 'style of' and 'after'. This terminology also helps you gauge the date and authenticity of a piece and affects its value. Each item in the catalog will show the price Kensington Auctions expects the object to sell for. If there is no estimate in the catalog, it may be pinned up in the saleroom. If not, you can ask the auctioneer. Please note that our estimates should always be taken as only a rough guide. Our estimates are never a guarantee of the final sale price. Set yourself a bidding limit. Pay particular attention to the condition of the piece and take into account the potential cost of restoration, which can be considerable, before deciding on your bidding limit. Choose a top price and stick with it. Work out your timing. Some sales last for several hours. So if the lots which interest you are towards the end of the sale find out how many lots the auctioneer expects to sell per hour to work out roughly when your lot will be sold; but always remember to allow yourself extra time. Follow the bidding. When the sale begins, the auctioneer will call out each lot number and will start the bidding at slightly below the lower estimate. As the people signal to him by waving or nodding he will call out their bids in regular sums or increments. Attract attention to your bid. In a packed saleroom don't be afraid to attract the auctioneer's attention: wave your catalog or bidding card and call out if need be. However, if the bidding is rising rapidly, the auctioneer will usually only take bids from two people at a time. When one drops out he will look around the room for someone else to join in. If you are still within your limit that is your moment. The auctioneer will indicate that the bidding is finished by banging a small hammer, called a gavel, on the rostrum, and recording the sale and the name or number of the successful bidder. Please visit us to get your item valued. Find out if you need to register and make an appointment with a valuer in advance if necessary. At Kensington Auctions, valuation is free. It is important to provide as much information as possible. We will ask you for anything you can tell us about the item. The history of an item, known as its 'provenance', can help enormously in its correct identification and valuation. Even details which might seem insignificant to you can help our valuer's, so if you know your table once belonged to Aunt Ethel who lived in Wales who bought it from a local 5th generation duchess, then don't forget to give us this important factoid. 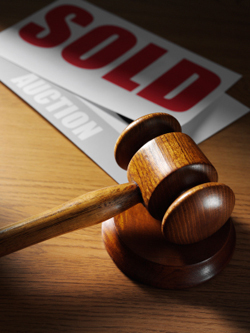 At Kensington Auctions we refer to our method of selling as The "Auction Method." This means much more than just making a sale. We orchestrate a business transaction and enter into a commitment to meet the needs of our clients-both the seller and the buyer. We take responsibility for the entire auction. We dedicate many long hours to prepare for and facilitate the sale so that when the Kensington Auctions gavel falls, the outcome is positive for both the buyer and seller.